Summertime. It's officially time to break out the barbecue and enjoy spending time outside. A great place to spend time with family and congregate with friends is an outdoor patio or deck. 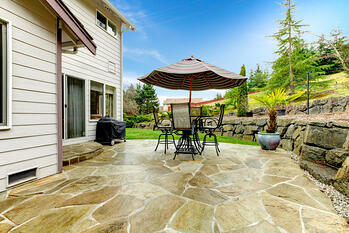 Additionally, a great patio/deck and backyard can add some serious value when it comes time to sell your home. Here are some things that you can do to make sure your patio is ‘entertaining ready’ both this summer and beyond. Every few years, you should take the time to stain and seal your wood patio. This is a fairly simple process with many products combining both steps into one. Unless the patio has become uncomfortable to stand on, it’s not necessary to sand anything. Washing a patio too much can cause the stones to wear down faster, however, a yearly power wash can make a world of difference. Fill the space between stones with polymeric sand to prevent grass from growing and bugs making a new home. With all patios, it’s important to sweep regularly. This will prevent build-up that can stain and damage your cement surface. Use your garden hose and dish soap for all basic cleanings. For the tougher stains, use equal parts water and bleach, scrub, and rinse. For all surfaces, use mild cleaners such as detergent. Chemicals like chlorine can discolor your surfaces and damage your plants. To get rid of weeds, try using an alternate you probably already have sitting around the house. For example, white or apple cider vinegar. If you need some extra cash for your summer backyard projects, try a home equity line of credit. Similar to a credit card, you borrow money as you need it, using the equity in your home. These loans usually feature lower interest rates compared to traditional loans. If you are interested in learning more about HELOCs, check out our website or contact a home loan advisor at 801-260-7600 ext. 5340.